I went over to my local Target store this morning just after it opened and I got the first Story HD they sold. This post will touch on my first impressions of the device but it won't get into a real depth. I've only had it a couple hours and it's not bad. I'm not sure I'd get this over the Kindle, but it's a reasonably safe purchase. You might not like it, but buying this device won't be some horrible mistake. Physically, it's slim and light and is about the same size as the K3. Ars Technica complained about gold colored buttons, but I don't see what the problem is. The color helps accent the buttons when you're looking at them but it's mild enough that it doesn't distract me from reading. The general physical appearance is good. There's the keyboard, and above the KB are 5 buttons: home/back, a d-pad (the silver bar), and enter/option. There's a full size SD card slot on the right edge, USB port on the lower edge, and a power switch on the lower back (also the sleep button). On second glance, the KB is fairly sophisticated so I'm going to have to spend more time playing with it. The silver bar is also the page turn buttons, and up/down change the pages just like left/right. The bar is placed rather low for a page turn button, but it seems to work okay. I think my preferred way to hold the Story HD will be with my thumb to the north of the bar. This will let me click the bar with the side of my thumb in order to turn the page. This should let me keep a good grip on the ebook reader. I just pulled out a Kindle case I wasn't using and the Story HD fit. It's ever so slightly too wide, so it's not a perfect fit. But that's not important; the case covers up the power switch which means I can't use the case. The screen is absolutely gorgeous, but I was somewhat concerned about image rendering. Iriver seem to be handling that okay. All the color book covers I tested rendered well on the Story HD. This is a software issue, not hardware, and I make a point to test it ever since I had my hands on the Hanlin A6 (which was bad at rendering images). The resolution is astounding; I didn't realize the difference until I had the Story HD and the Kindle side by side. I'm looking at them now, and yes there's a difference. But I'm not sure I care. The higher resolution is great, but the standard E-ink screen is just fine. It's a screen that has been used for years and I'm quite happy with. BTW, I'll wager $10 that the next Kindle also has this screen (Sony, too). You only have bookmarks, font size, and PDF reflow/zoom as reading options. The keyboard is largely a waste; you can't type notes or really do anything with it. The margins are narrow , and the test has a ragged right edge. I like both details, but I can understand that some won't. There are no formatting options, so this might be a killer. That's all for now; I have other things to get to (sorry). 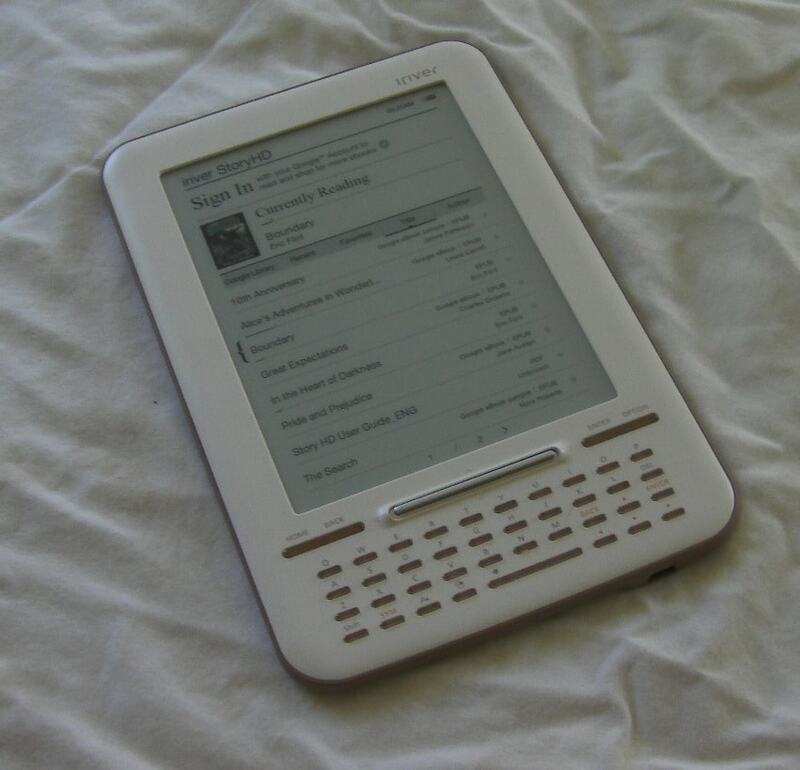 I'm not sure yet that it's as good as the Kindle, but I do think it's better than any of my other Kindle clones. P.S. Ars Technica have a number of pictures, in case you're interested. What fw do u have? In Europe is still 1.00 and I was expecting the US versions could be more advanced but your description of the device is so similar to the mine. That´s a pity, this eReader could be awesome but need a lot of improvements in the fw. Amazon has iriver Story HD cases. They are made by Kiwi cases. Thanks for posting your first impressions. I got the paper today and it was listed, so I went online and the website said that the reader was sold online only. Off to Target now. I hope they are in stock. I skipped past a review somewhere that says it does not search *inside* books. That true? Seemed screwy to me, but I didn’t stop to read as I have no interest past the hi-res screen. Nope, no search inside books. That’s why I didn’t list it. GTFOH! How can a SEARCH company align itself with something that CAN’T do search?! That really makes it useless. Hell, I could even see the point of wanting to search *fiction*, FFS! Thanks for your first impressions. Re whether it might do better than the Kindle, with that screen (never mind other features or lack of them) if the touchscreen and that resolution are what’s most important, then it’s better than the Kindle. However, if one’s interested in other features, besides having no search inside books, it can’t do annotations either. I do think it’s important to mention/list something that’s lacking though! if it’s something that many avid readers would want to use and there’s a value judgment on whether it’s better than other readers or not. Especially for bookclubs or just for trying to remember who’s who in a book [Search]. Does the iRiver HD synch with the Android Google Books app? It should work in most countries, yes. Just make sure that you check the power supply before you plug it in.